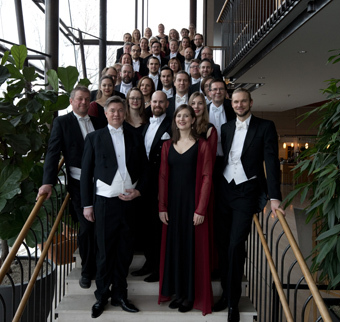 Eric Ericson Chamber Choir was founded in 1945 by then 27-year-old Eric Ericson, and has since taken a central position in the Swedish and international music scene. Eric Ericson and his choir’s great interest in always finding new music and exploring new areas makes the ensemble’s repertoire very wide to this day: from early music to the latest and newly composed. For generations of Swedish and international composers, the choir has been an ideal ensemble with its typical “Nordic” sound and consistent virtuosity. To uphold the legacy of Eric Ericson means preserving and developing that unique timbre, deepening the chamber musical attitude and searching out new repertoire. After Eric Ericson passed away in 2013, Fredrik Malmberg was engaged as chief conductor, working alongside Swedish and international guest conductors. In Eric Ericson Chamber Choir you find Sweden’s foremost ensemble singers who, beyond their own solo singing careers and other important musical endeavours, have chosen to take part in this vital ensemble work. On the world stage, Eric Ericson Chamber Choir is among the very foremost professional ensembles, and through the years it has been awarded many distinctions. The choir makes several tours abroad each year, but also works educationally with amateur choirs around Sweden. In its long history, the choir has made numerous recordings, available in the catalogues of many record companies. Highlights of the international work include collaborations with the Swedish Radio Choir and the Berlin Philharmonic Orchestra, with conductors such as Claudio Abbado, James Levine and Riccardo Muti, as well as the many recordings and concerts with Nicolas Harnoncourt and the Concentus Musicus Wien.